The purpose of our trip was to attend my niece's wedding, which we did and it was lovely. Our trip was winding down and I was ready to head home. On the way back, I really wanted to see the nation's capital Ottawa, Ontario. I absolutely loved it! It's such a beautiful place filled with history. The best way to describe it is through pictures. The Peace Tower in Parliament Hill. I wanted to go inside but everything was closed. 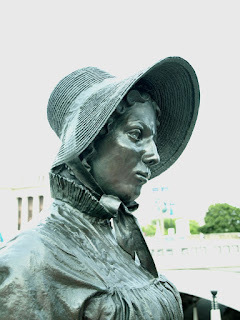 Laura Secord. 19th Century Chicks rule! 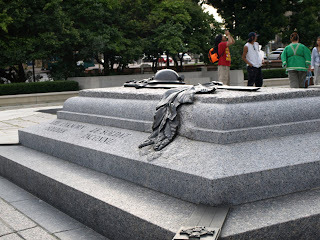 Tomb of the Unknown Soldier at the National War Memorial. What a nice way to end the trip! Still, we had two more solid days of driving. I was so happy to see my house again and sleep in my own bed. What a great trip! I think we'll be planning an Ottawa trip for next summer...I can't wait! I hope you'll have a great time. I would have liked to have done a lot more there but we didn't have time. That was a great way to end your trip. 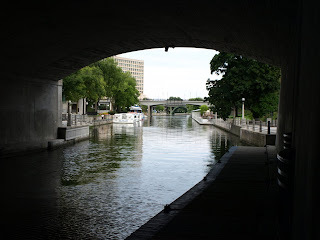 The canal is gorgeous - did you get to ride a boat on it? I love the Lara Second statue! Great way to end the trip. 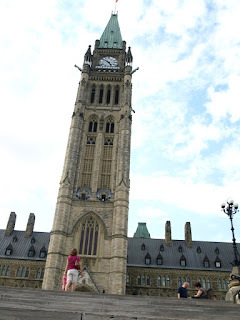 I really liked Ottawa when I was there a few years ago. Glad you enjoyed! Karen- Sorry. I didn't really know what we'd be doing from one day to the next. Beth- I loved that too. She was the only statue I was excited to see. Court- We did. And I wouldn have loved to stay longer.